Some people say rain on your wedding day is a sign of good luck. If they’re right, then Brendan & Allieca must be in for the happiest of all marriages! With their original ceremony & reception site cut off by rising flood waters, their January wedding went ahead despite very wild weather, thanks to a last minute venue change. 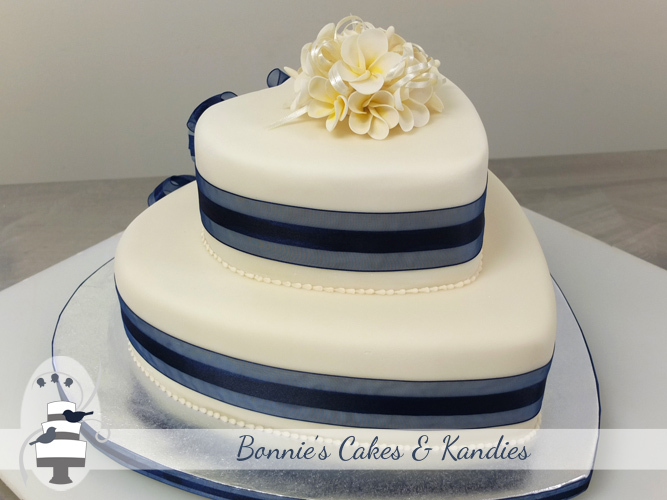 When I delivered their wedding cake the day before they were due to marry, I found them still searching for an alternative venue. 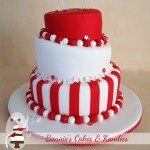 I was amazed and so impressed at just how calm the couple were under the circumstances! 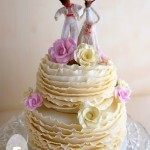 Below are some photos of their two-tier, heart-shaped ivory wedding cake. 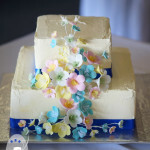 The cake was covered with a rolled white chocolate fondant, and decorated with frangipani icing flowers and navy ribbon. 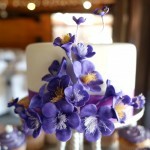 Bottom tier: dark chocolate mud cake. 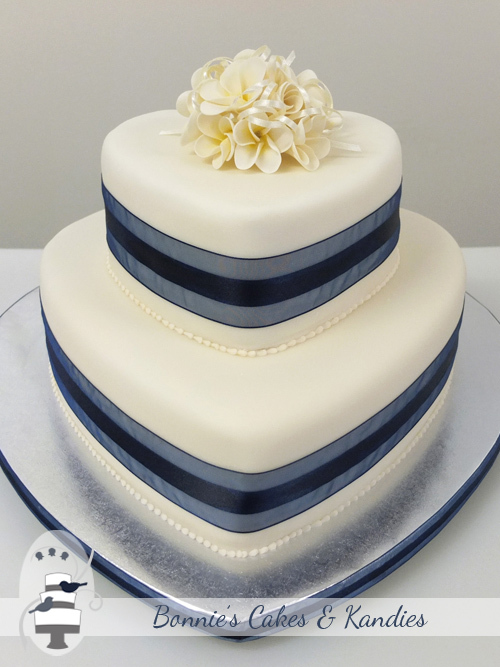 Top tier: traditional fruit cake. 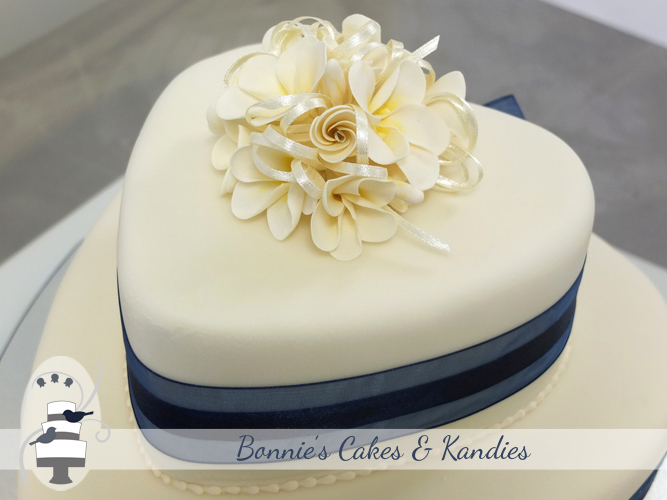 Two-tier, heart-shaped ivory wedding cake with frangipani flowers | Bonnie’s Cakes & Kandies, Gympie. 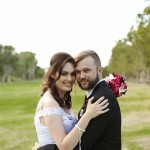 Brendan & Allieca were determined not to let the unbelievable weather stand in their way, and I was so relieved for them when I found out that although very brief to avoid being stranded on the other side of town; their wedding ceremony had gone ahead. 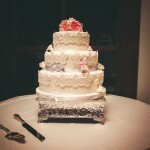 Photography: Michelle Schulga Photographer, Wedding cake: Bonnie’s Cakes & Kandies. 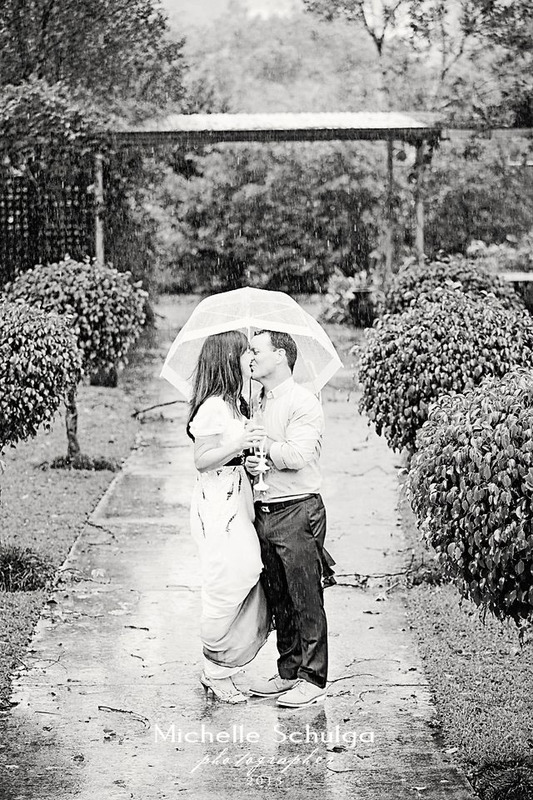 Happiness radiates from the bride & groom on their very wet wedding day! Stunning image captured by Michelle Schulga Photographer. 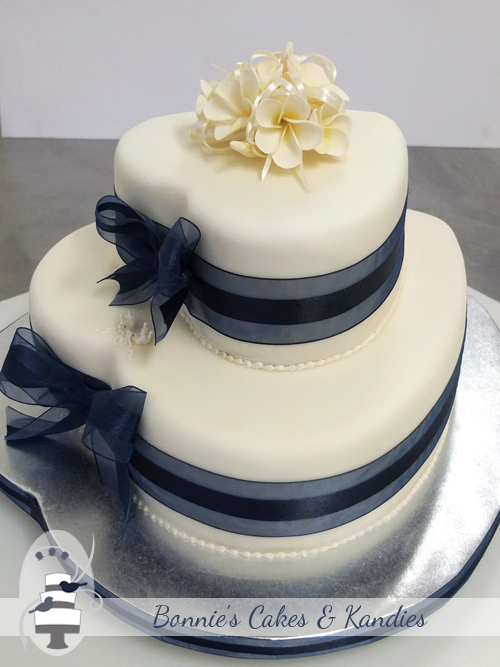 Congratulations Brendan & Allieca – may you have a wonderful adventure together!